Registrations are required, so make sure you register today and we’ll send you further tips and information leading into your race PLUS you will receive a weeks FREE training! Registrations close 12 noon on the Friday before each race – so register now to avoid missing out! Join us at Elwood race 1 for the season opener for FREE Tips and Tricks. Join us at Sandringham for race 2, FREE Tips and Tricks. Join us at Elwood Race 4 for the for our FREE Tips and Tricks. Join us at Portarlington for Race 5 for FREE Tips and Tricks. Our Pre-Race Tips & Tricks Clinics are informative and highly recommended for those who have not completed a triathlon before, haven’t raced at the race venue, haven’t been to our Tips & Tricks Clinic before OR simply need a refresher! Tri Alliance will have a number of Coaches on hand to assist with your queries before and after the clinic which are held the Saturday before each race of the 2XU & FUN Tri Series. 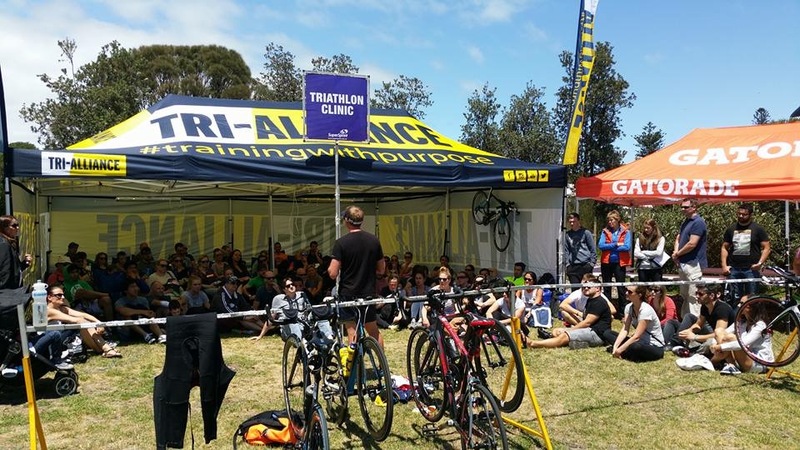 Held at 12:30pm on the Saturday before each race of the 2XU Triathlon Series, meet at the the Tri-Alliance Marquee (fondly known as the TA TAJ) which will be located near the event registration area. This is a FREE clinic as part of your entry into the 2XU Triathlon Series.